He has appeared at coffee houses and venues throughout New England. In the 90s he was a finalist in the Boston Acoustic Underground competition and performed on three of the Folk Next Door concert compilations at the University of Hartford CT. Several of his car related tunes were on NPR’s “CarTalk” radio show. 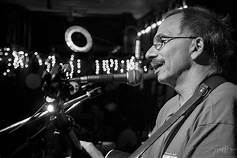 He has opened for many artists from Tom Paxton, the late Bill Morrissey, and Robert Earl Keen to Arlo Guthrie and Dar Williams.